Making his debut in Capcom's Resident Evil 2, Leon S. Kennedy managed to deal with the stress of a new job rather well, considering that his first day included battling hordes of flesh eating undead. Transferring into the Raccoon City Police Department, Leon is placed in a situation that is far from what his training prepared him for but still manages to rise to the occasion, refusing to lay down and die. Though seemingly naive, Leon is far from it, and has a strong grasp on the situation even when others' cooperation is not in his favour. After fighting his way out of the horrors unleashed by Umbrella, Kennedy's exploits are revisited six years later in Resident Evil 4 where we find that he's matured quite a bit since we've last seen him. Recruited by the U. S. secret service, Leon is sent to find and retrieve the President's daughter, where he shows audiences around the world that he's one of the toughest in the business and always sees his mission through to the end. 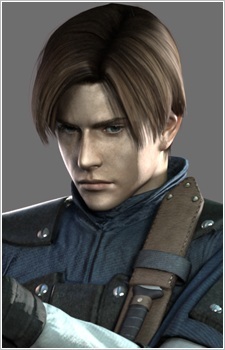 Leon is also in Resident Evil: The DarkSide Chronicles in the year 2002 before Resident Evil 4 happened with his ex-partner, Jack Krauser, before Jack ever worked for Albert Wesker. Leon tells Jack the events of Resident Evil 2 and Code Veronica. He then finds out the T-Veronica virus is in Javier's possession, which infected his daughter. In Resident Evil 2 he meets Chris's younger sister, Claire Redfield, along with a women named Ada Wong, scientist Annette Birkin and daughter Sherry Birkin. On his first and last day as a police officer for the Raccoon City Police Department, Leon finds out that he is being followed by Sherry's father, William Birkin, who injected himself with his newest creation, the G-virus. Birkin quickly begins transforming into a hideous monster and destroys everything in his wake. Leon and Claire escape the city and find an underground lab for Umbrella where Leon meets Ada one final time before her apparent death. Alas, it is revealed in Resident Evil 4 that through a mysterious source (later revealed to be Wesker) she did not actually perish. Leon appears to possess some romantic affection for Ada.